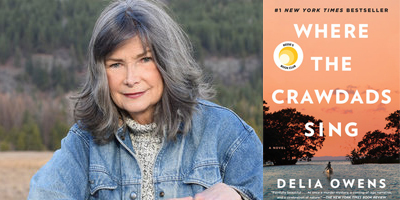 Legions of readers continue to flock to WHERE THE CRAWDADS SING (G. P. Putnam’s Sons), the mesmerizing first novel by Delia Owens, propelling the title to #1 on The New York Times hardcover fiction and combined print & eBook fiction bestseller lists. One of the book’s most enthusiastic fans is actress Reese Witherspoon, who made it a Reese Witherspoon x Hello Sunshine Book Club Pick, is producing a feature film adaptation, and said, “I can’t even express how much I love this book! I didn’t want this story to end!” Throughout the narrative, Kya Clark, “The Marsh Girl,” emerges as a literary character for the ages. In this “Behind the Pages” interview, Delia Owens, the co-author of three internationally bestselling nonfiction books about her life as a wildlife scientist in Africa, offers fascinating insights – how her own life experiences shaped the creation of Kya, the reasons she chose the North Carolina coastal marsh as the setting for her novel, and the difference between writing fiction and nonfiction. How is your main character, Kya Clark – abandoned by her family at age ten, rejected and scorned by town locals – able not only to survive her circumstances but also build a satisfying life for herself? Kya is every-little-girl and one in a million. Kya is all of us. She represents what we can be when we have to be. I believe in her with all my heart. I believe all of us can do more than we can imagine when life requires it. I was careful to write her survival in a realistic and believable way. To me, the story had to be feasible. I purposely kept Pa around until Kya was ten, an age at which she was capable of gathering food and firewood, cooking, and boating in the marsh and sea. And of course, by then she could run or hide from anyone. So, by the time she was truly alone, it was quite possible for her to survive on her own abilities. But let’s not forget. Kya was also adventuresome, witty and spunky. And full of love. Once she has the chance to be with others, some of her more hidden traits begin to shine. Kya grows up in solitude and isolation. You’ve lived in some pretty isolated places yourself. Have your experiences as a researcher in remote areas of Africa informed your creation of this character? Much of my adult life—more than twenty-three years—was spent in either extreme or partial isolation. For one seven-year period, I and one other lived in the Kalahari Desert and were the only two people in area the size of Ireland. (There were a few bands of roving Bushmen to the south, but so remote we never saw them.) In the Luangwa, I had my own camp in a very isolated spot, meaning that for twenty-three years I was isolated. Even now in Idaho, I usually see other people only once or twice a week. So, yes, most definitely, my experiences created Kya. I know what it is like to be alone. To make friends with baboons and brown hyenas because there are no other girl friends around. I know how isolation can make you feel insecure and inadequate. What it is like to avoid people when you go to town because you don’t belong. All of this is Kya: alone, unsure, awkward around people, but strong, capable, knowledgeable, and very spunky on her own. And in the end, the confidence she gains from self-reliance in nature gives her the strength to thrive in man’s world. In the novel, the North Carolina coastal marsh is itself almost a character. What made you choose this setting for your story? The coastal marsh of North Carolina, and Nature in general, is definitely a character of the novel. As one line of the story reads, “… Kya laid her hand upon the breathing, wet earth, and the marsh became her mother.” After her family left her, Kya had no one but Nature to teach her about life, and there is no better teacher if we take the time to observe and listen to the wild. Kya honed her skills of harvesting mussels by watching the crows; she learned about dishonest signals from fireflies; she learned about loyalty and friends from the seagulls. I chose the coastal marsh because I was somewhat familiar with it and knew other marshes and swamps of the southern states very well. When I was a girl, I went canoe camping with my mother in the Okefenokee Swamp and other wild places. Another reason for choosing this marsh is that, although it was a wild place, it is conceivable that Kya could have survived on her own. Collectable food was bountiful, as she shows us so well; temperatures are mild; hiding places abundant. And companions like Jumpin’ and Mabel were not too far away. You’ve co-authored three nonfiction books. Were there surprising differences or similarities to writing fiction? My nonfiction books followed strong story lines, with a beginning, middle and end, so in that way the writing was similar to writing a novel. Also, the nonfiction books were character-driven—even if the main characters were lions, brown hyenas or elephants. But of course, with nonfiction, there are the constraints of dates, times, and facts that must be accurate, yet these real-life events don’t always flow within a good story line. I loved the freedom of writing fiction. Of letting my imagination go as far as it would take me. You can always pull back in, take a more conservative course. But why not soar for a while just to see what happens? A character can look, say, feel whatever works best for the tale. You can never do that with nonfiction. To me writing fiction is like riding a horse through the gate and into the mountains. You take off and are never quite sure where you will end up.